A week before the season’s biggest weekend the Wilroc Sprint cars and IMCA Modifiedes entertained a good size crowd Saturday night at Saratoga Speedway with the seasons fastest night of racing. The Tyee Chev/Brian McLean sponsored night at the Black Creek oval also included the Bomber cars and the Road Runners and was capped off by a green white checkered 35 lap Sprint car main event. The sprint car main saw 11 cars take the green flag with Black Creek’s Dwanye Zienstra grabbing a first lap lead before giving way to Tim Openshaw on lap 8 a lead he would hold until lap 15 when Victoria’s Mike Haslam would take over the lead. Haslam the winner of the June 24th main would have a battle on his hand as Mike Schott got by Openshaw on the next lap and got right on Haslam’s bumper where he would stay for the next 19 laps as the two pulled away from the field to make it a 2 car race. Haslam’s bumper was as close as Schott would get as Haslam went mistake free to capture his 2nd straight Saratoga Sprint car main ahead of Schott and Openshaw, Greg Sagmoen and James Miller. Openshaw a former IMCA Modified point champion would kick start the Sprinters night with win in the trophy dash then would win the first heat followed by Haslam winning the 2nd heat. The Sprint cars return for their 3rd and final visit August 19th. The Modifiedes saw Chris Beaulieu continue his dominance as he went from the 11th starting position on his way to his 2nd straight main event win to increase his overall point lead over Travis Stevenson to 152 points which is the biggest point difference of all the classes. The 11 car 35 lap race turned out to be a very competitive and saw Campbell River’s Jeff May take a first lap lead which he would hold for 23 laps until Beaulieu powered his way under him to grab the lead and then go uncontested for the remaining 12 laps. With first place gone May who has had to overcome a number of motor issues limiting his race finishes pushed his car over the races final laps to hold off a challenging Stevenson to finish 2nd with Don Hallgarth and Brad Kotscheroski finishing 4th and 5th. Dano Bryant started his night off with two wins in the trophy dash and first heat while Stevenson grabbed the win in the 2nd heat. In Bomber cars, Campbell River’s Boston Larson the current point leader posted a clean sweep after posting fast time, and wins in the heat race and 25 lap main event with Gary Marcus wining the only race Larson wasn’t in the trophy dash. The 7 car main event saw Larson move into the lead early in the race and would go unchallenged to win ahead of Chad Taks and Muarry Degraag and with the win Larson improved his point lead to 48 over Taks. The Road Runners were running a makeup race night and they ran three races and came away with three different winners as Garrett-Ann Rosner would win the trophy dash, Ryan Guest the heat race and Austen Hack current point leader in the class would win the main event. 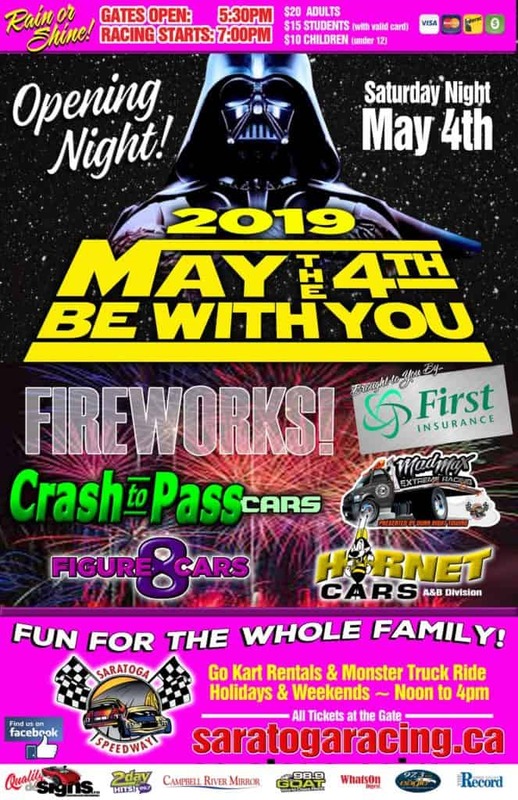 This Saturday and Sunday night the speedway hosts what has been on a yearly basis their biggest of the season as the Monster Trucks invade the 3/8’s oval for two nights of car jumping entertainment. The weekend events are rain or shine and usually draw cars out of Victoria will be see two days of Crash to Pass and Mad Max excitement along with the Hornet cars and the Road Runners. The two races in this weekend may go a long way to deciding this season points champions with a number of point races being very close. In the chase for the championship in the Crash to Pass division Scott McLellen holds a slim 17 point lead over Mike Jenkins while in the Road Runners Hack leads defending point champion Guest by only 39 points. The battle in the Hornet cars has Carter Hintz sitting on a 41 point lead on Luke Dixon in the A division while the B division has Randi Joyce ahead of Evan McLuckie by 116 points and Danielle Antonik goes into the weekend 118 ahead of Damon Dunn in the Mad Max division….